A traveler from Adelaide to Canberra has to drive through Moulamein because some bridge on the main route is out. He thinks “I’ll take a pic for my mate because he often talked about teaching here way back”. In front of the sign he meets a genial local and they get talking. Her name is Dot Jenkins. The traveler mentions his mate’s name who was there 1966-67. “Oh yeah,” she says something about the croc incident. 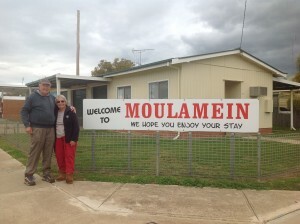 Moulamein? Croc? The traveler was Bill Gresham, a great mate, and writes to ask me what was that about? Summer of 66 the Moulamein Central School captain, Terry Owers, and I hatched a plan to adventure north right to the top end. His VW was better nick than mine so off we went. I had been the year before (hitchhiking) and we had good time in the Katherine river catching baby crocs, under a foot long. We had a dozen and one bigger and then we caught one 3 foot long that gave us a bit of a wrestle. Another one we thought we had bailed up in the shallows till we realized the distance between his eyes was the same as a horse, and when he made a dash we got out of the road. The 3 footer traveled well in wet towels back home. At a stay in my sisters place in Brissy we showed her the cute babies, then the one bit bigger then the 3 footer. Finally I conned her son into coming down to the car with a bolster and blanket and pretending we were bringing up a 10 footer to put in the bath – we were pretend wrestling with the writhing beast and my poor sister, loving me as much as she did, was trying to stop me. When we got back to Moulamein the baby crocs were a hit and I had one in the aquarium in class. Good reason to like school – playing with baby crocs. The 3 footer I put in a pen made of chicken wire beside my caravan. He had water and meat and seemed happy but one day he was gone. The manmade lake was just across the road and figured that is where he was headed. No way he could survive the winter. But next spring there were sightings and they kept growing, along with his size. A foot a year since 67 is a good maths test for the Grade 3ers I was teaching. Somehow the numbers were a bit on the high side. As they got older (they would now be 58) the croc grew at an alarming rate, depending on how long they had been fishing and sinking tinnies.